A few months ago Dex's teacher asked me if I would help the kids make a quilt. I probably should have given some thought to what this would entail but of course I just said yes. This turned out to be a lot of work but it was fun and the kids really enjoyed the process and the final result. 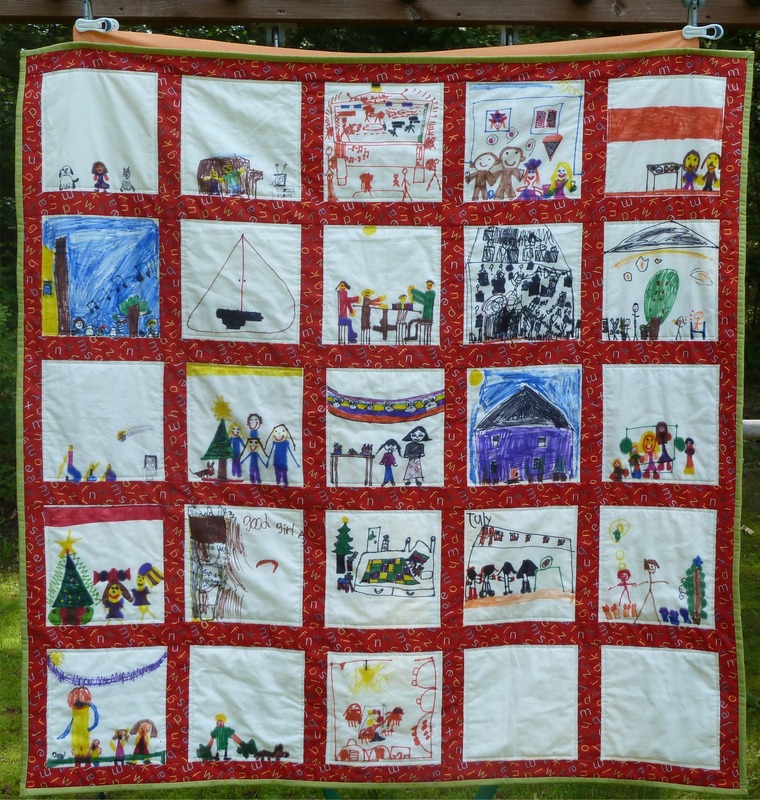 The kids each drew a picture of a family tradition which they then drew on fabric. I backed the muslin for the pictures with freezer paper which gave it some stability and helped keep it from stretching. The drawings were done with Sharpies which seemed to bleed. If I did it again I'd look for markers made for fabric. Another day I went in and helped each kid sew a strip of sashing to the side of their picture block. At each stage a few kids were absent so there were more visits and delays... Last week I decided I really wanted to get this done before the end of the school year. I sewed in 2 blank squares for the stragglers and finished up the top. I'd ordered fabric for the back and binding on-line so I was stuck anxiously awaiting it's arrival knowing I was going to be in Maine for the weekend. It showed up Friday afternoon so I spent the rest of the day piecing the back together, making binding and basting the quilt. 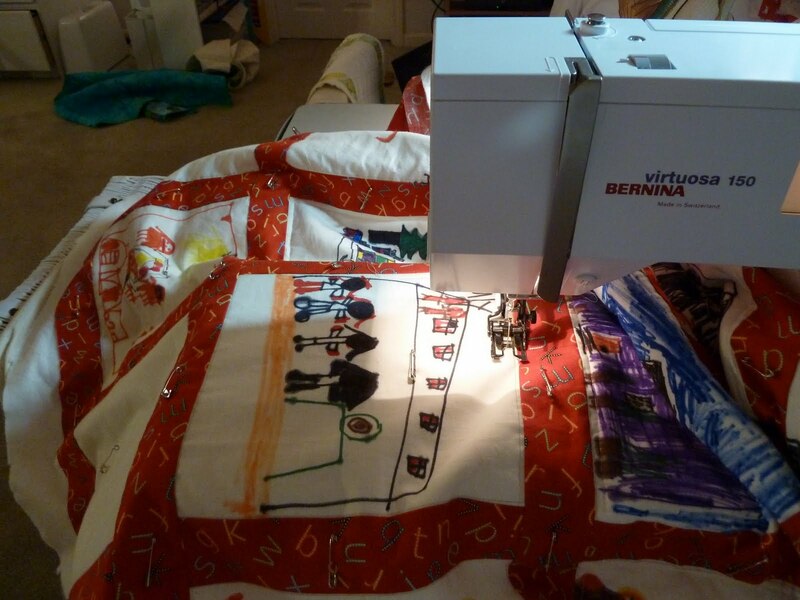 That night I pulled a marathon quilting session with some help from the Twilight saga and Starbucks and got it all quilted and the binding sewn on. A 2 hour car ride is always good for getting a binding tacked down so it worked out perfectly. 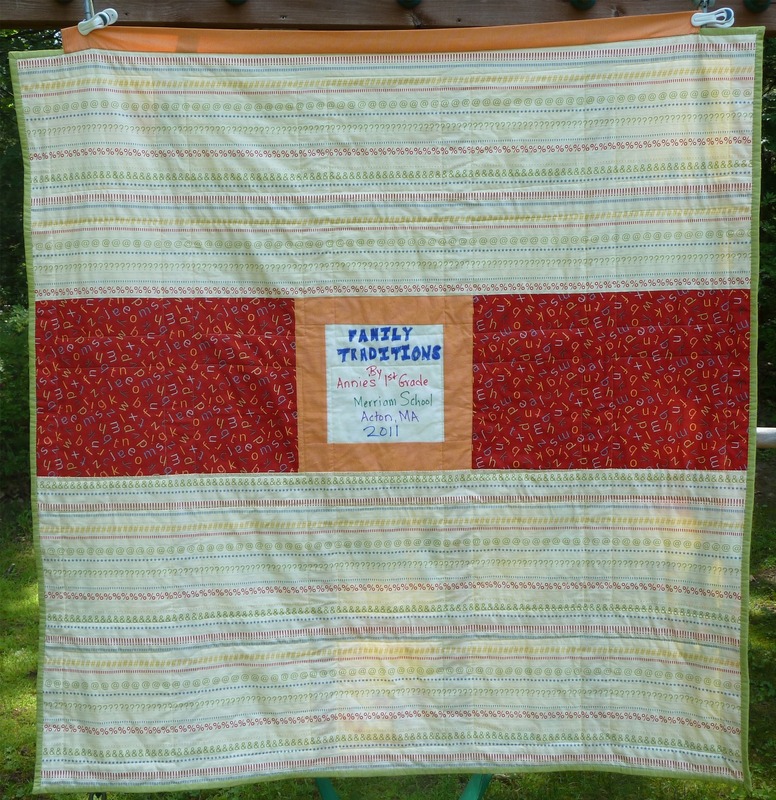 I put the last stitches in the binding on the way home Sunday night and was able to drop the quilt off to his class yesterday. That is so great! I'm sure the teacher & children loved seeing the finished product!